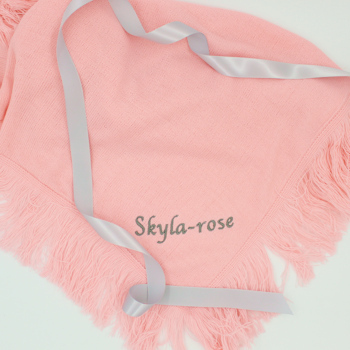 Pink Christening or baptism shawl in soft knit with fringed trim, the perfect gift for every baby on their special day. Swaddle baby in this soft and comfortable baby shawl made of fine quality acrylic that is very gentle to babies skin. Delicate knit with a fringe around the egdes this little shawl measures 74cm x 74cm. We can professionally embroider a name, initials or date of birth. If you don't want a name perhaps it can say My Christening. Choose your text thread colour and letter font style. Select if you would like to add on a little motif of a cross, heart or star. We will sew this towards one corner of the baby shawl. Add that unique touch and make this a really special gift!